Summary: Don't miss this beautiful original digital story by Lauren Kate, the #1 New York Times bestselling author of the Fallen series, set in the romantic world of Teardrop, a place of devastating secrets and dark magic . . . a world where everything you love can be washed away. Review: Now there is a reason why this review is being posted before the actual Teardrop review. If you get a chance to read this before devouring the first in this breath-taking trilogy then you really must. I didn't really have a choice as this short wasn't available when I got stuck into Ander and Eureka's story. 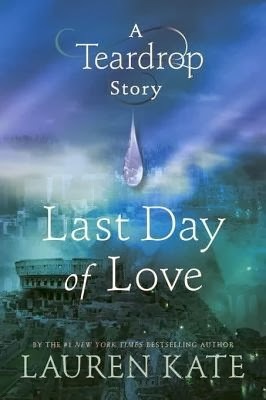 The Last Day Of Love is Anders story, from his POV. In reading this you get to understand a bit more about the troubled guy. For me this gave me a great insight into why he is the way he is in Teardrop. It makes you realise just how cruel families can be thanks to tradition. This short story just added to the admiration and love I have for Lauren Kate's writing and this fantastic trilogy. The Last Day Of Love can be devoured very quickly I started it on the way to work and had practically finished by the end of my lunch break. I loved this addition to the trilogy and I hope Lauren will do another from Eureka at a later date. I cannot wait for the next installment. My actual Teardrop review will hopefully follow this post in a day or so.